David Singontiko, your new WSOP champion. We're witnessing quite a scene here. David Singontiko of California has just won his first WSOP bracelet — in the first event he's ever entered! — besting a field of 946 to win Event No. 51, the $1,500 Pot-Limit Omaha Hi-low Split-8 or Better event. His group of joyous supporters have surrounded him, and it looks like the celebrating will be continuing for some time this evening. It was a hard-fought ten-handed final table that saw several big chips swings, some clever play, and more than a few moments of good fortune along the way. 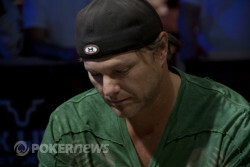 During the very first orbit of play, David "Doc" Sands lost his huge chip lead and more than two-thirds of his stack after losing a huge hand versus Jeffery Gibralter. Sands would hang on a while longer before exiting in 10th and missing the official final table. While Gibralter maintained his newly-gained chip lead, the short stacks fought for a while before soon falling one by one, with John Reiss (ninth), Robert Campbell (eighth), and Cliff Kettinger (seventh) going out in short order. The Brazilian Marco Oliveira — with recent bracelet winner Andre Akkari on the rail cheering him on — went out next in sixth, followed soon by Thomas Scarber in fifth. Meanwhile, Singontiko was accumulating chips, and after knocking Igor Sharaskin in fourth in a particularly unlucky hand for the Russian, held a large chip lead when three-handed play began. It looked like Michael Yee was destined to go out in third, stuck on a short stack for much of the time the trio played. But a huge pot developed between Singontiko and Gibralter that saw the latter hit the rail in third, and it would only take a couple more hands for Singontiko to take the last of Yee's short stack. The story we're hearing is that Singontiko worked several months for his father's mortgage company at $10/hour to save up for this one event, his first ever at the Series. Soon after winning, Singontiko gave his father a call to tell him the good news — in three days he'd earned a cool $268,235 with that $1,500 he saved up working for his dad! Not to mention a nice piece of jewelry to commemorate his effort. The celebrating is still going on, and it's hard not to smile as we watch. Congratulations to David Singontiko! And thanks for following our coverage of Event No. 51 here at PokerNews. A life changes in an Instant; three days that is. In only the second hands of heads up, David Singontiko and Michael Yee got it all in preflop when Yee only had 325,000 left. 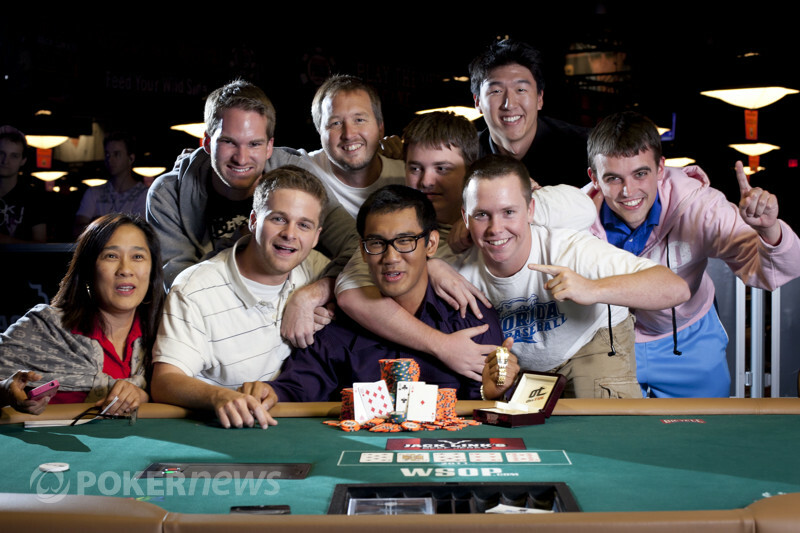 The board ran out and when the ten hit the river, Singontiko's whole rail went nuts and he fell to the floor as they realized he had just won a bracelet in his first ever WSOP event. That momentum of Jeffrey Gibralter's just came to an abrupt halt in a big hand between himself and chip leader David Singontiko. Gibralter opened with a raise to 130,000 from the button, Michael Yee folded, and Singontiko reraised the pot to 415,000. Gibralter thought a moment, then called the reraise, leaving himself about 920,000 behind. The turn was an especially bad card for Gibralter -- the -- giving Singontiko a full house and leaving Gibralter needing a friendly low card to win at least part of the pot. But the river was the , and Gilbralter is out in third. Singontiko bumps up to 3.7 million, and will have a huge advantage over Michael Yee to start heads-up play. Yee has just 375,000. 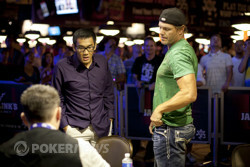 Jeffrey Gibralter raised to 85,000 from the button, Michael Yee folded, and David Singontiko called from the big blind. The flop came all clubs -- -- and Singontiko checked. Gibralter bet 75,000, then Singontiko check-raised the minimum to 150,000. Gibralter called. The turn then brought the and both checked. The river was the , and Singontiko checked again. Gibralter pushed out a bet of 250,000 this time, and Singontiko sat with his head down for several seconds before letting his hand go. Singontiko still leads with 2.24 million, with Gibralter climbing to 1.42 million. Yee, meanwhile, is still the short stack with a little under 600,000. Singontiko called on the button, Jeffrey Gibralter called in the small blind, and Yee raised it up to 200,000 in the big blind. Singontiko called and Gibralter folded. The flop came down and Yee went all in for his last few chips and Singontiko called. The turn and river were and to give Singontiko the high and split the low between the two. After the hand, Yee had only 250,000 left. The very next hand though, Yee got it all in preflop with both Gibralter and Singontiko calling. The two checked it down, and on a board of Yee took it down with for a pair of kings to go along with the sixes on the board. Jeffrey Gibralter has been chipping back up over the last few hands. He just picked up a few more in a hand versus leader David Singontiko. 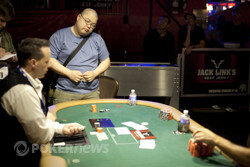 After Michael Yee folded, Singontiko completed from the small blind, Gibralter raised to 105,000, and Singontiko called. The flop came and both checked. The turn was the . This time Singontiko checked, Gibralter bet 175,000, and Singontiko called. The river was the and both checked. Gibralter showed for a small flush and no low, and Singontiko mucked. Gibralter is back up to 1.35 million, while Singontiko is now at about 2.25 million.